ZIMBABWE – Harare Zimbabwe’s former vice president Joice Mujuru said on Tuesday she had launched a new party to challenge her ally-turned-adversary Robert Mugabe, promising to revive the economy and repair relations with the West. Mujuru was Mugabe’s deputy for a decade and seen as the veteran president’s likely successor until he fired her in 2014 on charges of leading a plot to oust him. In her first public address since then, she told reporters the new Zimbabwe People First party would bring jobs and review the ruling ZANU-PF party’s divisive black economic empowerment laws, which critics say have scared off investors. She said she was open to alliances with other opposition groups before 2018 presidential elections, though there was no immediate comment from the other organizations and no independent estimate on the size of her support. “Today we confirm our existence as a viable, inclusive home-grown political party,” Mujuru, 60, said to cheers and ululation from supporters. “We are not fighting one man but a system, that system which is unjust,” she told an audience that included journalists, Western diplomats and four former cabinet ministers fired by Mugabe. Zimbabwe is struggling to emerge from a deep recession that shrank its economy by nearly half during the decade to 2008. It is also facing its worst drought in years. Zimbabwe has had particularly strained relations with former colonial ruler Britain and the West since 2000, when Western powers imposed sanctions on Mugabe’s government accusing him of election violence, rigging and rights abuses. Mugabe, 92, denies the charges and says Britain lobbied its allies to punish Zimbabwe for taking commercial farms from white farmers, in an often-violent land seizure drive. 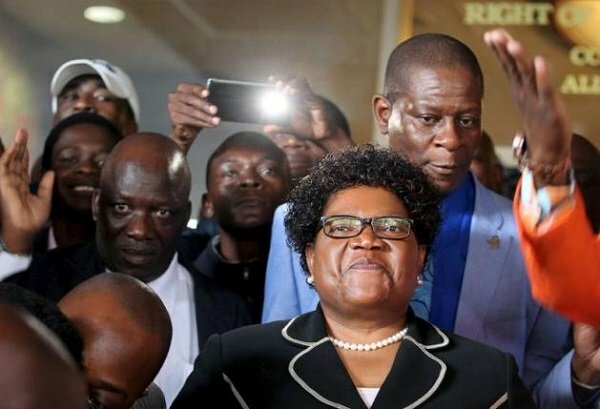 Mujuru, like Mugabe, took part in Zimbabwe’s 1970s independence war, and her aides say she still enjoys support from some of her comrades who hold senior positions in the politically powerful military. She has rarely been seen in public since losing her party and government posts, resorting to issuing statements in newspapers that hinted at a future challenge to Mugabe. An interim management team would run Zimbabwe People First until it elects leaders at a convention this year, she said.